Fluidized-bed granulators (e.g. Aeromatic, Glatt) have a similar design and operation to ﬂuidized-bed driers, i.e. the powder particles are ﬂuidized in a stream of air, but in addition granulation ﬂuid is sprayed from a nozzle on to the bed of powders. It is ideal for a wide range of both heat sensitive and non-heat sensitive products. Heated and ﬁltered air is blown or sucked through the bed of unmixed powders to ﬂuidize the particles and mix the powders; ﬂuidization is very efﬁcient mixing process. Granulating ﬂuid is pumped from a reservoir through a spray nozzle positioned over the bed of particles.The ﬂuid causes the primary powder particles to adhere when the droplets and powders collide. 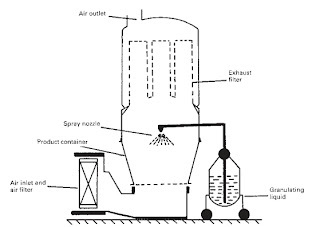 Escape of material from the granulation chamber is prevented by exhaust ﬁlters, which are periodically agitated to reintroduce the collected material into the ﬂuidized bed. 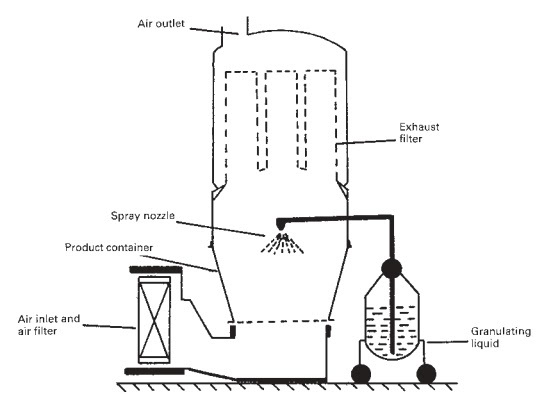 Sufﬁcient liquid is sprayed to produce granules of the required size, at which point the spray is turned off but the ﬂuidizing air continued. The wet granules are then dried in the heated ﬂuidizing airstream. 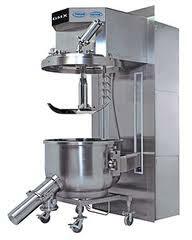 High-speed or high shear mixer/granulator is used extensively in pharmaceutics. The machines have a stainless steel mixing bowl containing a three-bladed main impeller, which revolves in the horizontal plane, and a three-bladed auxiliary chopper (breaker blade) which revolves either in the vertical or the horizontal plane. The high shear mixers have been applied for high speed dispersion of dry powders, aqueous or solvent granulations, wet granulation, melt granulation, effervescent products and melt pelletization. Blending and wet massing is accomplished by high mechanical agitation by an impeller and chopper. Figure shows a vertical high mixer, which is the most widely used version in the pharmaceutical industry. Mixing, densification, and agglomeration of wetted materials are achieved through shearing and compaction forces exerted by the impeller. The impeller rotates on the vertical shaft at a rotational speed corresponding to a radial blade tip speed of approximately 5-15 m/s. the chopper rotates at a similar tip speed which, because of its small diameter, corresponds to a very high rotation speed in revolutions per minute (rpm)(i.e. 1500-4000 rpm). The primary function of chopper is to cuts lumps into smaller fragments and aids the bowl or sprayed onto the powder to achieve a more homogeneous liquid distribution. Dry granulation converts primary powder particles into granules using the application of pressure without the intermediate use of a liquid. It therefore avoids heat–temperature combinations that might cause degradation of the product. Two pieces of equipment are necessary for dry granulation: ﬁrst, a machine for compressing the dry powders into compacts or ﬂakes, and secondly a mill for breaking up these intermediate products intogranules. Slugging is a pre-compression process for the formation of extra large tablets (slugs), usually of variable weight, due to poor flow of the drug powder. The dry powders can be compressed using a conventional compression tablet machine or, more usually, a large heavy-duty rotary press can be used. This process is often known as ‘slugging’, the compact made in the process (typically 25 mm diameter by about 10–15 mm thick) being termed a ‘slug’. The resulting slugs are subsequently broken down into granules, A hammer mill or oscillating granulator is suitable for breaking the compacts, which are recompressed to obtain the final tablets. The procedure is applicable to the dry granulation of hydrolysable drugs, such as aspirin. In the dry granulation methods, particle adhesion occurs cause by compaction pressure. A compact or sheet is produced which is larger than the granule size required, and therefore the required size can be attained by milling and sieving. In wet granulation methods, liquid added to dry powders has to be distributed through the powder by the mechanical agitation created in the granulator. The particles adhere to each other because of liquid ﬁlms, and further agitation and/or liquid addition causes more particles to adhere. The precise mechanism by which a dry powder is transformed into a bed of granules varies for each type of granulation equipment. The granulation mechanism can be divided into three stages. dry methods (dry granulation/slugging) : no liquid is used. In a suitable formulation a number of different excipients will be needed in addition to the drug. The common types used are diluents, to produce a unit dose weight of suitable size, and disintegrating agents, which are added to aid the break-up of the granule when it reaches a liquid medium, e.g. on ingestion by the patient. Adhesives in the form of a dry powder may also be added, particularly if dry granulation is employed. These ingredients will be mixed before granulation. The dry granulation process is used to form granules without using a liquid solution because the product to be granulated may be sensitive to moisture and heat. Forming granules without moisture requires compacting and densifying the powders. In this process the primary powder particles are aggregated under high pressure There are two main processes. Either a large tablet (known as a ‘slug’) is produced in a heavy-duty tabletting press (a process known as ‘slugging’) or the powder is squeezed between two rollers to produce a sheet of material (roller compactor or chilsonator). In both cases these intermediate products are broken using a suitable milling technique to produce granular material, which is usually sieved to separate the desired size fraction. The unused ﬁne material may be reworked to avoid waste. What is Granulation and Why Powder Should Granulated ? Granulation is the process in which primary powder particles are made to adhere to form larger, multiparticle entities called granules. Pharmaceutical granules typically have a size range between 0.2 and 4.0 mm, depending on their subsequent use. Granulation normally commences after initial dry mixing of the necessary powdered ingredients so that a uniform distribution of each ingredient through the mix is achieved. After granulation the granules will either be packed (when used as a dosage form e.g effervescent granule, soluble granule), or they may be mixed with other excipients prior to tablet compaction or capsule ﬁlling. The reasons why granulation is often necessary are as follows. Tablet manufacturing by direct compression (DC) has increased steadily over the years. It offers advantages over other manufacturing processes, such as wet granulation, and provides high efficiency. The choice and selection of binders is extremely critical for Direct Compression tablets. has good compression behavior : volume reduction under applied pressure and flow behavior in order to have optimum binding performance. ability to carry high amounts of active ingredient. Currently, only a few materials meet the criteria to allow their classification as DC binders. Lubricants work by reducing friction by interposing an intermediate layer between the tablet constituents and the die wall during compression and ejection and also between particle during compression. Boundary mechanism, results from the adherence of the polar portions of molecules with long carbon chains to the metal surfaces to the die wall. Example : Magnesium stearate. Hydrodynamic mechanism i.e. fluid lubrication where two moving surfaces are separated by a finite and continuous layer of fluid lubricant. Since primarily lubricants are required to act at the tooling or material interface, lubricants should be incorporated in the final mixing step, after granulation is complete. When hydrophobic lubricants are added to a granulation, they form a coat around the individual particles (granules), which may cause an increase in the disintegration time and a decrease in the drug dissolution rate. Presence of lubricants may results in a less cohesive and mechanically weaker tablet because it may interfere with the particle – particle bonding (Lessen tensile strength). Surface area is important parameter for deciding lubricant efficiency. Lubricants with high surface area are more sensitive to changes in mixing time than lubricant with low surface area. Therefore lubricant mixing time should be kept minimum. Mixing time in 1 batch production scale is about 3 minutes. Tooling used to compress the tablet is important for deciding type and level of lubricant used. Additional lubricant is often added to the tablet formulations that are to be compressed with curved face punches. The amount of lubricant increases as the particle size of the granulation decreases but its concentration should not exceed to 1% for producing maximum flow rate. Lack of adequate lubrication produces binding which can results in tablet machine strain and can lead to damage of lower punch heads, lower cam track, die seats and the tooling itself. And it may also yield tablets with scratched edges and are often fractured at the top edges. With excessive binding the tablet may be cracked and fragmented by ejection. it should preferably be colourless or nearly so. Powdered cellulose has acceptable compression properties, although the flow properties of most brands are poor. However, low-crystallinity powdered cellulose has exhibited properties that are different from standard powdered cellulose materials, and has shown potential as a direct-compression excipient. Powdered cellulose also acts as a bulking agent to increase the physical size of the dosage form for formulations containing a small amount of active substance. Powdered cellulose incompatible with strong oxidizing agents, bromine pentafluoride, sodium nitrite and fluorine. Powdered cellulose products consist of finely divided amorphous and crystalline a-cellulose particles. Powdered cellulose may be used alone or together with other fillers such as lactose, calcium phosphates, dextrans and others. It possesses poor compressibility and exhibits poor flow properties. It has poor binding properties and low dilution potential. It possesses some degree of inherent lubricity. Incompatibilities : Powdered sucrose may be contaminated with traces of heavy metals, which can lead to incompatibility with active ingredients, e.g. ascorbic acid. Sucrose may also be contaminated with sulfite from the refining process. With high sulfite content, color changes can occur in sugar-coated tablets; for certain colors used in sugar-coating the maximum limit for sulfite content, calculated as sulfur, is 1 ppm. In the presence of dilute or concentrated acids, sucrose is hydrolyzed or inverted to dextrose and fructose (invert sugar). Sucrose may attack aluminum closures. 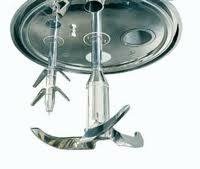 It requires high machine pressures, especially in cases with over wetted granulations. It possesses good binding properties. It produces gritty mouth feel (i.e., it is not free from grittiness). Sucrose serves as a dry binder (2–20% w/w) or as a bulking agent and sweetener in chewable tablets and lozenges. Tablets that contain large amounts of sucrose may harden to give poor disintegration. Starch is a polysaccharide carbohydrate consisting of a large number of glucose units joined together by glycosidic bonds. As a diluent, starch is used for the preparation of standardized triturates of colorants, potent drugs, and herbal extracts, facilitating subsequent mixing or blending processes in manufacturing operations. Starch is also used in dry-filled capsule formulations for volume adjustment of the fill matrix, and to improve powder flow, especially when using dried starches. Starch quantities of 3–10% w/w can act as an antiadherent and lubricant in tableting and capsule filling. In tablet formulations, freshly prepared starch paste is used at a concentration of 3–20% w/w (usually 5–10%, depending on the starch type) as a binder for wet granulation. The required binder ratio should be determined by optimization studies, using parameters such as tablet friability and hardness, disintegration time, and drug dissolution rate. • 13% for wheat starch. Compared to other filler-binders, a-lactose monohydrate exhibits relatively poor binding properties. It consolidates mainly by fragmentation. It has higher brittleness compared to spray-dried lactose and anhydrous b-lactose. a-lactose monohydrate (100 mesh) is often combined with microcrystalline cellulose. This combination results in a stronger synergistic effect on disintegration time, whereas the crushing strength increases as the percentage of microcrystalline cellulose in the blend is increased. The strength of tablets compressed from a-lactose monohydrate increases with a decrease in particle size of the excipient. Lactose monohydrate is not directly compressible and therefore it is suitable for use in wet granulation. It has poor flow properties. a-lactose monohydrate is water soluble. It produces a hard tablet and the tablet hardness increases on storage, disintegrant is needed in formulation. Drug release rate is usually not affected. Occurs discoloration with amines and alkaline materials (i.e. browning or maillard reaction). It contains approximately 5% moisture and hence is a potential source of instability especially with moisture sensitive drugs. Spray-dried lactose is produced by spray drying the slurry containing lactose crystals. The final product contains mixture of crystals of lactose monohydrate and spherical agglomerates of small crystals held together by glass or amorphous material. The for0mer contributes fluidity and the latter gives the compressibility to the product. It has excellent flow properties and binding properties. It deforms plastically compared to the same sized a-lactose monohydrate particles. Amorphous portion of the spray-dried lactose is responsible for the better binding and plastic deformation. Disintegrant is required in the formulations containing spray-dried lactose. The tablets require a lubricant, but the lubricant does not affect binding. It has poor reworkability. The calcium phosphates, here includes, the dehydrate and anhydrous form of dibasic calcium phosphate and tribasic calcium phosphate. They are granular insoluble materials. They are widely used both as wet granulation and direct compression diluents in tablet formulation. It is also used in pharmaceutical products because of its compaction properties, and the good flow properties of the coarse-grade material. Bulk density of calcium phosphates is higher than that of organic fillers. They are used extensively in vitamin and mineral preparations. Calcium phosphate is used both as an excipient and as a source of calcium in nutritional supplements. It is used particularly in the nutritional/health food sectors. The predominant deformation mechanism of anhydrous dibasic calcium phosphate coarse-grade is brittle fracture and this reduces the strain-rate sensitivity of the material, thus allowing easier transition from the laboratory to production scale. However, unlike the dihydrate, anhydrous dibasic calcium phosphate when compacted at higher pressures can exhibit lamination and capping. This phenomenon can be observed when the material represents a substantial proportion of the formulation, and is exacerbated by the use of deep concave tooling. Co-processing means combining two or more materials by an appropriate process. Co-processing of excipients could lead to the formation of excipients with superior properties compared to the simple physical mixtures of their components. The main aim of co-processing is to obtain a product with added value related to the ratio of its functionality/price. The products so formed are physically modified in such a special way that they do not loose their chemical structure and stability. A fixed and homogenous distribution for the components is achieved by embedding them within minigranules. Segregation is diminished by adhesion of the actives on the porous particles making process validation and in process control easy and reliable. Now a days direct compression technique has been one of the well-accepted methods of tablet manufacture. An extensive range of materials from various sources have been developed and marketed as directly compressible diluents such as lactose, starch, cellulose derivatives, inorganic substance, polyalcohols, and sugar-based materials. Major limitation of co-processed excipient mixture is that the ratio of the excipients in a mixture is fixed and in developing a new formulation, a fixed ratio of the excipients may not be an optimum choice for the API and the dose per tablet under development . In addition to the development of directly compressible excipients by modifying just a single substance, co-processing of two or more components has been applied to produce composite particles or co-processed excipients. The composite particles or co-processed excipients are introduced in order to provide better tableting properties than a single substance or the physical mixture. Magnesium stearate is the most commonly used and most effective of all lubricants. It is also the most likely to cause compression & dissolution problems. Concentration, grade and mixing parameters must be carefully controlled. These stearates are alkaline in reaction. Incompatible with strong acids, alkalis, and iron salts. Avoid mixing with strong oxidizing materials.Magnesiumstearate cannot be used in products containing aspirin, some vitamins, and most alkaloidal salts.. Magnesium stearate has good glidant and anti-adherent properties. incompatible with bases, reducing agents, and oxidizing agents. Solid at room temperature, these materials melt at compression pressures and temperatures to impart a lubricating effect. Vegetable oil usually used in combination with talc, silica or a silicate to prevent sticking to tablet punch faces. Incompatible with strong oxidizing agents. Light mineral oil is an efficient lubricant. But since it must be finely sprayed onto granules and powders to be used, it also can cause noticeable mottling or spotting on tablet surfaces. For these reasons, it is not commonly used anymore. But can still be found in some formulations. Has been used as a water-soluble lubricant for some water soluble and effervescent tablet formulations. Fairly high concentration and low particle size needed to be moderately effective as a lubricant. It has no glidant or anti-adherent properties. Effective at reducing ejection forces but does not help much for sticking to punch faces. Therefore, it must be used in conjunction with an anti-adherent. magnesium ions.Sodium lauryl sulfate is incompatible with salts of polyvalent metal ions, such as aluminum, lead, tin or zinc, and precipitates withpotassium salts. formulations as a lubricant. Disintegration times increase and tablet strength decreases with increase in mixing time. Glyceryl palmitostearate is incompatible with ketoprofen and naproxen. In pharmaceutical formulations, glyceryl behenate is mainly used as a lubricant in the preparation of oral tablets and capsules. It has good binding properties, it does not affect tablet hardness and is,unaffected by mixing or production parameters. Sodium stearyl fumarate is reported to be incompatible with chlorhexidine acetate. Not particularly effective on its own as a tablet lubricant or glidant. But very effective with lubricants in the role of an anti-adherent in that it effectively prevents sticking to surfaces. When using talc, it should always be blended into the formulation first followed by the lubricant (i.e. magnesium stearate). Talc incompatible with quaternary ammonium compounds. Fumed Silicon Dioxide has no lubricant properties. It is commercially available as very fine particles (approx. 0.014 microns), which tend to agglomerate into “balls”. It functions by coating granules, etc. and reducing interparticulate friction of these thereby improving flow characteristics. For processing, this material must be screened into a batch. However, due to the extremely fine particle size, it should be pre-blended with another component to facilitate screening and distribution. It is an extremely effective glidant at low concentrations, and has anti-adherent properties at higher concentrations. However at higher concentrations, flow characteristics may actually be impeded resulting in an increase in weight variation. Colloidal silicon dioxide is hygroscopic but adsorbs large quantities of water without liquefying. Lubricants are agents added in small quantities to tablet and capsule formulations to improve certain processing characteristics. A lubricant is added to reduce friction between moving surfaces. To decrease friction at the interface between a tablet’s surface and the die wall during ejection and reduce wear on punches and dies. Enhance product flow by reducing interparticulate friction. Posses Minimal Adverse Effects on the Finished Dosage Form. Generally poor lubricants, no glidant or anti-adherent properties. Hydrophobic lubricants are generally good lubricants and are usually effective at relatively low concentrations. Many also have both anti- adherent and glidant properties. Moisture content Liquid polyethylene glycols are very hygroscopic, although hygroscopicity decreases with increasing molecular weight. Solid grades, e.g. PEG 4000 and above, are not hygroscopic. It is well known that ethanol or propylene glycol or mixtures thereof are used as carriers for paracetamol in the common paracetamol syrups. But, Oral administered syrup for children should be free from alcohol. Another reason is the bad taste of propylene glycol, the taste of this solvent is difficult to mask. Viscosity is important for consumers who use sweetened condensed milk or sweetened condensed cream as an ingredient to make a cake or drinks. If too watery to be wasteful, conversely if too thick will be difficult to get out of the hole made in the can. High calcium content in product will make the viscosity increase, result in thickened, otherwise the protein content is too low can result in decreased viscosity resulting in too watery. Condensed milk is obtained by subtracting (vaporize) the water content of the milk to water content is about 40%. The high content of sugar (sucrose) in sweetened condensed milk (ratio of sucrose in water, 62.5-64%) make sweetened condensed milk has a long shelf life, which is 12 months in sealed packages. When will be drunk, condensed milk should be diluted again with hot water or warm water. A milk products are categorized as sweetened condensed milk if the protein content is 6.8 - 10% and 8-10% for fat. What is Fat Soluble Vitamin? Vitamins are essential organic nutrients human Requirement in a matter of minutes. The fat-soluble vitamins are vitamins A, D, E and K. To some extent, this vitamin is different from water-soluble vitamins. This vitamin is found in fatty and oily parts of food. This vitamin is only digested by bile because it does not dissolve in water. The following sections provide detailed descriptions of each vitamin type. Vitamin A is produced from two different compounds are converted in the body into vitamin A. In animal food sources, are available in the form of retinol (pro-vitamin A); in plant food sources are in the form of beta-carotene (a substance in the form of yellow-orange color), which is less efficient than retinol for the production of vitamin A. This is why the recommended amount of vitamin A given in the form of retinol equivalents, RE. The recommended amount of vitamin A is 1000 micrograms RE per day for men and 800 micrograms for women. Vegetables and fruits are a carrier for vitamin A the most. Most of the foods that contain vitamin A is a brightly colored (but not all bright colored foods contain vitamin A). Vegetables rich in vitamin A include carrots, sweet potatoes, yellow squash, spinach and melons. Milk, cheese, butter and eggs also contain vitamin A.
Vitamin A is essential for the maintenance of corneal and epithelial cells of the vision. Actual function of the eye is to improve night vision, the ability to restore vision after reflected by a beam of light in the dark. Vitamin A helps growth and reproduction of bone and teeth. At the time of growth, the bone will experience little decomposition, then stretching before finally rebuilt. Vitamin A is required in the first step, the process of bone breakdown. As you know, children who have deficiencies in vitamin A will not grow well. In addition, vitamin A also plays a role in the formation and regulation of hormones and helps protect the body against cancer.